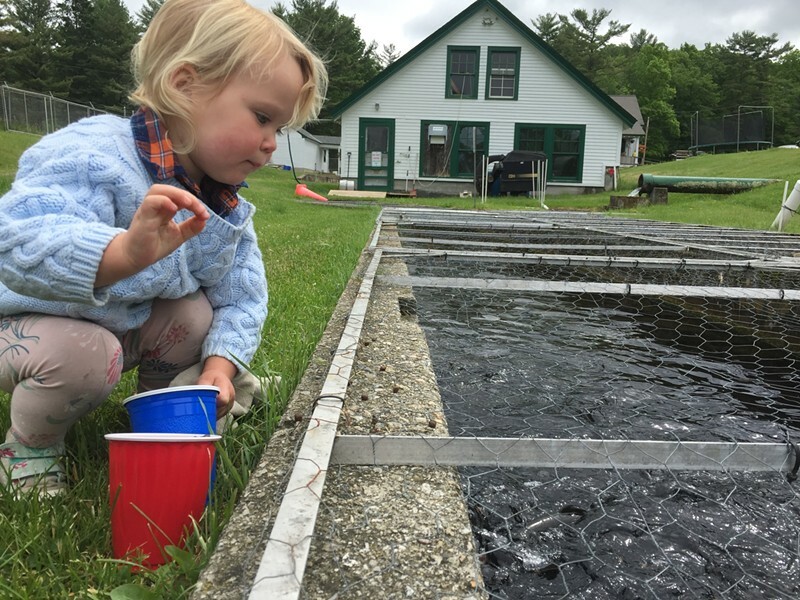 Updated March 21 at 10:04 a.m.
A Vermont fish hatchery slated to close next year over water quality concerns appears to have won a temporary reprieve from Gov. Phil Scott’s budget ax after angler and hunter groups agreed to pay more for licenses. If approved by the legislature, the deal would provide an additional $310,000 to keep the Salisbury Fish Culture Station open for another year while the state explores ways to prolong its life or move the hatchery operations elsewhere. “I feel like people have come together in good faith to try to keep the hatchery operating, and they’re working toward that goal,” Fish & Wildlife Commissioner Louis Porter said Wednesday. The hatchery, which opened in 1931, raises brook, brown, rainbow and lake trout that produce eggs used by the four other fish hatcheries in the state. Most of the fish stocked in Vermont streams and lakes begin their life cycles in Salisbury. Wastewater discharged from the facility contains nutrient levels that exceed water quality standards, according to Julie Moore, secretary of the Agency of Natural Resources. That water runs into an unnamed tributary of Hanlon Brook that is considered an impaired water body, Moore said. Upgrading the facility to clean the discharge would cost an estimated $13 million, funds not in the proposed budget. It does include $280,000 to upgrade other hatcheries if Salisbury is forced to close, Porter said. But even if the hatchery operation could be transferred to another facility, the state’s fish production capacity would still drop by 20 percent, he said. The hatchery deal came to light Tuesday when Rep. Robin Scheu (D-Middlebury) outlined for fellow Democrats the status of a sweeping $9.15 million fee bill making its way through the legislature. The bill calls for raising fees on fishing and hunting licenses by $2 per year, from $26 to $28. Combination licenses would increase $5, from $42 to $47. That would raise about $150,000 next year. An additional $160,000 would come from the general fund. The Scott administration struck the deal after angling and hunting groups agreed to the modest fee increases to keep the hatchery open for now, Porter said. Mike Covey, executive director of the Vermont Traditions Coalition, said his members are doing their part and are encouraged to see the Scott administration and legislature doing theirs. “Hunters, anglers and trappers have long been the backbone of the successful restoration of game and non-game species for all Vermonters and are once more stepping up as expected,” Covey said. Porter called raising fees a concern. “On the other hand, I think it’s important that we maintain our ability to raise fish for angling and restoration,” he said. Without the additional funds, the department would have been forced to begin shutting down the facility and laying off some of its four workers. Porter said his department will analyze a number of future possibilities, including whether the discharge water quality can be improved for less than $13 million. Moore’s agency has committed to taking another look at how it tests water that leaves the facility, including a method that focuses not on chemical tests but on the health of bugs in the water, she said. She’s not, however, in favor of just changing the location that water samples come from. About a decade ago the agency moved the sampling spot from Hanlon Brook to the tributary closer to the facility. The goal was to better pinpoint the source of pollution in the brook. Moving the sampling site back to the brook doesn’t seem right to her. “Then you’re just arguing that the solution to pollution is dilution,” Moore said.